We are certain that you want your posts to receive great coverage among your audience. In order to achieve such effectiveness, simply make a checklist of actions required and stick with them each time that you make a post. In this article we will tell you about the seven ways in which to optimise your Facebook publications. Everyone knows that a photo with text on is perceived much better that simple text. We are sure you have posted lots of photos on your page already. 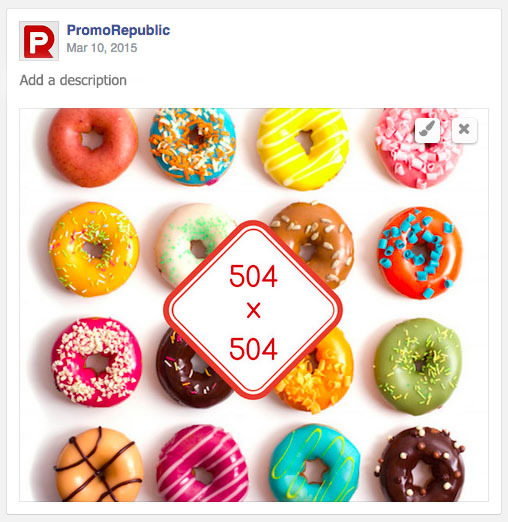 But, do you follow the simple rules of picture sizing? Do they look good when somebody shares them on their page? When you upload one photo to your timeline, it is automatically cut for display as a 504×504 pixel square. If you aim at using the maximum allowed space, you will have to upload square photos that are at least 504 pixels wide. However, if you upload more than one photo, the dimensions will be completely different. When you are about to create a unique picture for your content, it is strongly recommended to use an image that has dimensions no less than 1200×628 pixels. A perfect fit would be a 1200×1200 image, just to be sure it doesn’t lose its quality when compressed or cut. Insert the link into the Facebook post and allow it to automatically upload an image and description (this is called “link format”). If this image doesn’t meet your demands, replace it. If you post using the first method, your publication will contain only the things you put there, i.e. a photo and some text description. However, if you use the second method and insert the link first, your post will have additional info. For example, if you post a link to an article of your own, your post will contain the following: an image, an article name, an article description, a link and the link description (if you consider it appropriate). This way you have much more opportunities to interest readers in your article, as they can look through the post and get a basic feeling on whether it is worth clicking the link or not. It’s not a matter of life and death when it comes to which format you use, but Facebook claims that users are more prone to click on links posted in the link format. As a remark, we would add that the link can be deleted after it is auto-uploaded, which means that readers can go to your article by just clicking the image. Facebook presents us with two options for targeting an audience: one uses audience interests, while the other uses post end dates. 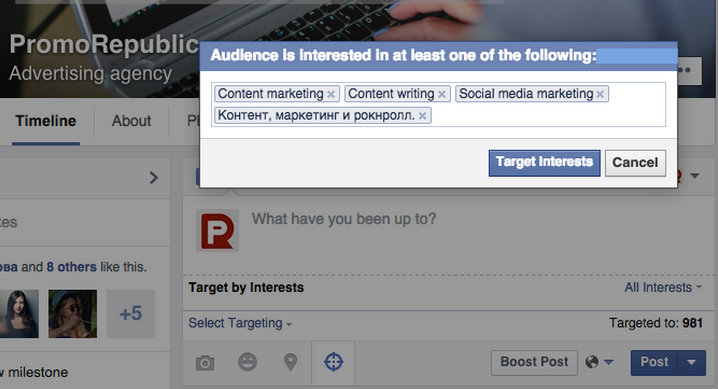 If you know your audience well enough, you can use target them according to their interests. In order to promote events and other posts that are time specific, you can target with “post end date”. When the defined date passes, people will not be able to see the post in their news feed. Let’s be honest, users don’t take the time to analyse posts in their news feed. If you want to get their attention, you’ll have to ask them do something specific. 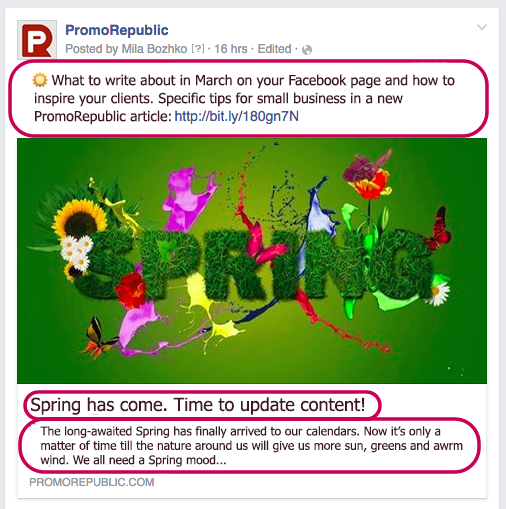 Always incorporate a call-to-action into your post, but just be sure it doesn’t look like a direct advertisement. In pursuit of getting the full effect from your publications, you’ll have to publish them during the time your audience is most active on the web. 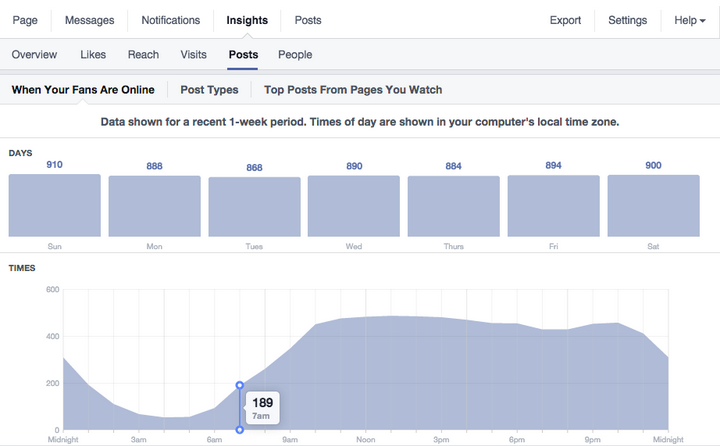 To get the gist of when that is, turn your attention to your page statistics in Facebook Insights. There you can see a breakdown of user activity by day and time. We would like to add that despite Facebook statistics, you will still have to use your common sense regarding your target audience. For example, if your target audience are primarily office workers, then lunchtime would be a very effective time for posting, as they are likely to be on their break. We urge you to experiment a little and find your own perfect publishing timetable. Advice: plan your publications 30 minutes prior to the optimal time. If your audience goes online at 9am, publish your post at 8:30am. 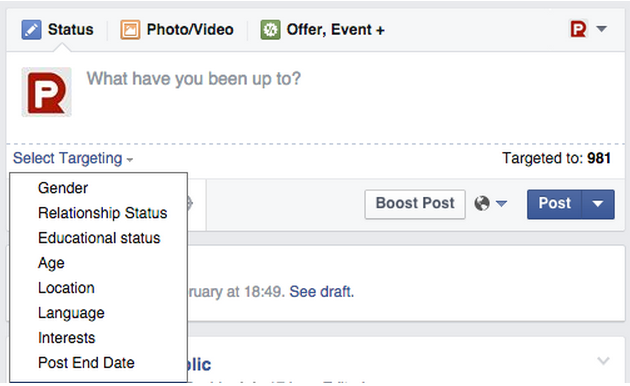 This way, when people log in to Facebook, your post will already be in their newsfeed. In order to simplify planning your publishing activity, use our calendar to designate the time and date of any and all of your posts. Everybody wants to sell their products and services through social networks, which is is the right thing to want!☺ However, it is imperative to do so correctly. When it comes to social networks, your audience’s primary concern is to have fun, not to plow through tonnes of advertisements. If you constantly create posts that use a transparent “selling” philosophy, you will be perceived as an advertiser by 100% of users. 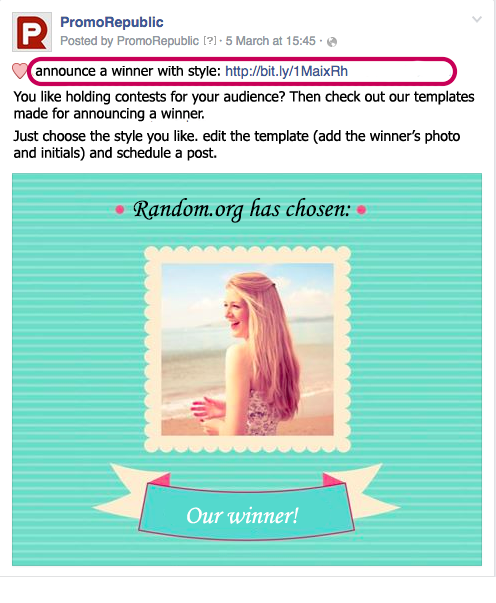 You may as well create an advertising campaign using Facebook, and be done with it. Utilise different forms of content on your page. Don’t solely publish text with a photo, or just simple text. There’s so much more you can do: videos, links, infographs, etc. Try using all the formats Facebook permits. 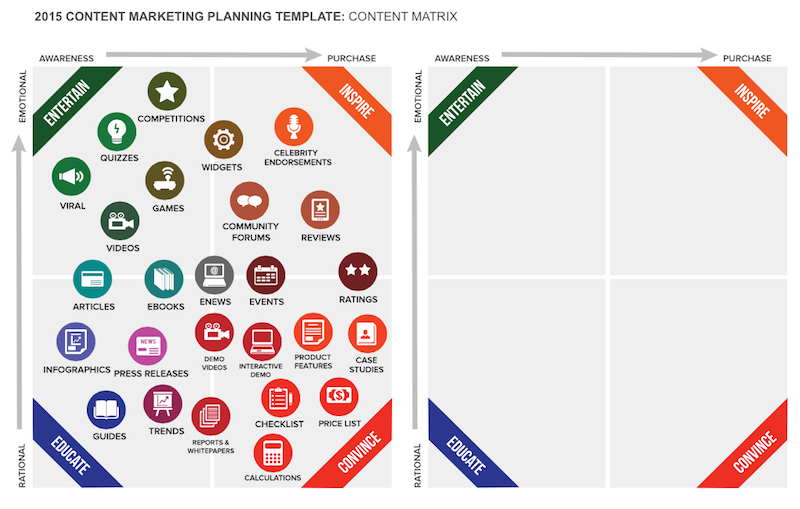 Below you can see Michael Stelzner’s matrix of content from his book “Content Marketing: How to Attract People With Content”.